These woodcuts don't make themselves, so it was time to get back to the Studio, bringing with me the current block. Grabbed a slice across the street, then got to my space and eventually got to work. The pencil doesn't always show up as well as one might like in these photos, but it's there enough for me to see what I'm doing. The thing I was working on most was the food in the foreground, for which I at least had a photo reference. In keeping with my orientation plan for the composition of this piece, I would have to reverse the image I had of the soft-shell crab platter, so the sandwich would end up on the right side of the drawing, and the fries and onion rings on the left. To get he basic shapes I just turned the page with the printed photo over and held it up to the light (window in front of me) so I could see it in reverse. To see more details, I used an actual mirror I keep in my printing cabinet. Not easy drawing an accurate deep fried crab in any direction- both symmetrical and irregular, and with so many appendages. Biology tells us that the crustaceans and arachnids developed along very different genetic lines, but he end results turned out to be quite similar. As for my drawing of the crab, color and value will play a big part in showing the form and shape and making sense of all the legs, etc. 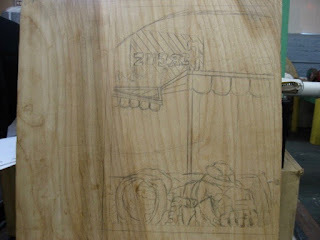 Also put in a little time on the Circus sign, but this will have to be worked on quite a bit before it is right. Luckily I got a bunch of photos of it before the building was demolished. Probably much of what I drew today will have to be redone, but you really can't fix things until you've got something down on paper (or wood) to fix. On my way out of the building I noticed wreathes and Christmas trees stacked around the hallway. So I stopped by the office to check with Nichole if the art show had to come down soon. She assures me that the Tenants art show will remain up for its full planned time, about 2 more weeks.